Related Series: According to wikipedia, an OAV episode exists. Notes: Thanks to Nicoletta for letting me do this one. Kousei Arima was a child prodigy at piano until the day his abusive mother, who taught him to play, died after a long illness; her death so traumatized him that he was no longer able to play at all. 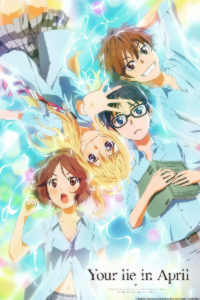 Now 14, Kousei encounters a young violinist named Kaori Miyazono, who encourages him to play again as her accompanist. This show is an A-1 Pictures production (Space Brothers, Gate) and features that company's trademark gorgeous, lavishly detailed artwork- those are possibly the most beautiful pianos ever!- and as for the character art, it's at least OK (the characters' mouths are drawn a bit too wide sometimes.) It's a (mostly) serious exploration of psychological trauma, and the power of love (or at least infatuation) to overcome it, and it features some impressively-performed pieces of classical music. So why isn't it five stars? I might as well go ahead and mention that other tsundere. She's Tsubaki, the usual childhood friend who discovers she's got feelings for Kousei despite what you might think from the show's opening scene. In that scene, which seems to set the mood for Kousei's encounters with women, Tsubaki hits a baseball into a classroom, and when she finds that the consequence was Kousei facedown in a pool of blood, she expresses thanks that the ball didn't hit someone who mattered. As for Mom, she messed up Kousei's mind and his body, yet he nevertheless clings to the worst parts of his relationship with her, to punish himself for the ONE time he dared talk back to her. He can't play piano anymore because every time he tries to, he imagines her scornful face, and then finds he "can't hear the notes" (the show uses, as a metaphor, an image of him trying to play the piano underwater.) He's an exasperating character, because he lets his guilt keep him from discovering that loss can also be liberation. (Ray Bradbury had a story, Jack-In-The-Box, about an even more psychopathically possessive mom, which beautifully illustrates the point.) Kousei's a "mama's boy" who not only can't admit that Mom's gone, but has let his own monstrous concept of her haunt him- and while she WAS objectively usually pretty awful, she might have been a bit more nuanced than the version in Kousei's mind. His seeming desire to cling to this demon rather than finally part with it made ME want to kick him, so maybe I can understand Kaori's feelings a little there. Japan's society is intensely competitive. Your Lie is my first introduction to Japan's world of competition in classical music, and I found it interesting that there are some competitions where one is required to play music rigidly "as the author intended it" (points are only based on technical competence), while others allow personal interpretations. Kousei was drilled by his mom in that first sort of performance, which Kaori rejects (she deliberately blows one competition that required it), while Kousei tries to heed Kaori's plea to follow the second path and put his own feelings into the music. For general audiences, a personal interpretation is definitely going to be more crowd-pleasing, and I was impressed by the arrangements and performance of much of the music here, and that's probably the one reason I went for four stars rather than three in the end. I can't leave this review without making some other comments on competition in Japan as evidenced by this show and by a show I've also been reviewing, Baby Steps, depicting competition in a very different field, tennis. In both shows, rivals are not necessarily personal adversaries- except within the "arena" itself, of course, where they MUST be- but might actually offer advice or assistance; two of Kousei's rivals since childhood, Emi Igawa and Takeshi Aiza, actually become quite supportive of him, and there's a lovely moment where he's sharing sandwiches with them. Also in both shows, we have knowledgeable insiders appraising the protagonist's performance- in Baby Steps they're standing by the fence verbally analyzing the opponents' strategies, while in the more "civilized" atmosphere of the concert hall we're just hearing their thoughts, but I was somewhat surprised that the music teachers in the Your Lie audience were much more brutal in their critiques of the performers than the sports professionals in Baby Steps were of THEIR players. The present reviewer will try to follow the Baby Steps critique formula- unless he's TOO overwhelmingly offended, of course.